Male Capuchin monkeys are known to wash in urine to become more sexually attractive to females, according to a new study published in the American Journal of Primatology. The reason for capuchin monkeys urinating on their hands had previously been a mystery. Lowering body temperature and identification marking were two possible answers, but the new study has found that male urine excites or “turns on” female monkeys. This was discovered through brain scans of female tufted capuchin monkeys as they sniffed urine. The urine from sexually mature male monkeys created more brain activity than the urine of juvenile monkeys. 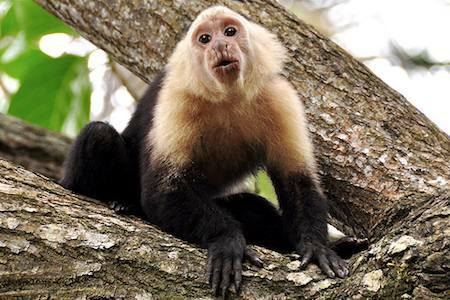 Researchers have deduced that male capuchin monkeys wash with their own urine to display their availability and attractiveness to female monkeys, and to convey social status. Capuchin monkeys are not the only species of monkey to “urine wash”. Mantled howler monkeys and squirrel monkeys are also known to urinate into their hands and then rub the urine into their feet and hindquarters. Researchers noted that the behavior is surprising because capuchin monkeys had not previously been known for using communication based on smell. Next post: Like Bhutan, Should We Be Measuring National Happiness Instead Of GDP?